Check out the new 60-second sneak peek of Ralph Breaks the Internet: Wreck-It Ralph 2, which introduces Wonder Woman actress Gal Gadot as the voice of Shank, the tough and talented driver in an intense online racing game called Slaughter Race. Ralph and Vanellope encounter Shank when they venture into the internet in search of a replacement part for Vanellope’s game, Sugar Rush. Shank’s approach to racing, and life in general, opens Vanellope’s eyes to the limitless possibilities of the internet and the excitement of a new world that feels like home to her. 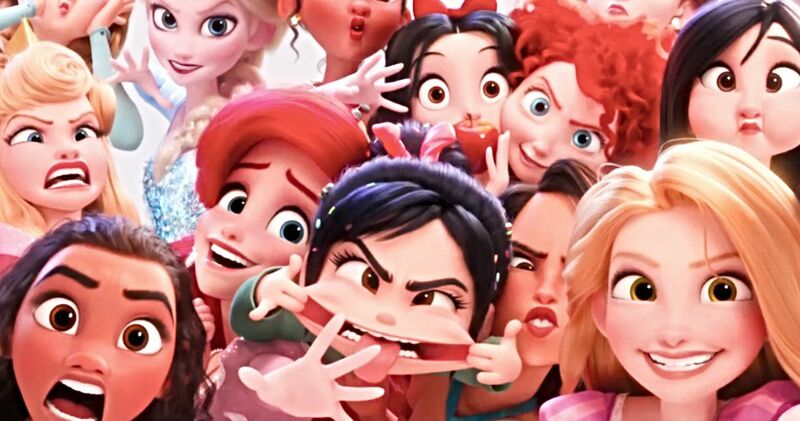 The new Wreck-It Ralph 2: Ralph Breaks the Internet sneak peek also shows Vanellope in a hilarious new scene with the Disney Princesses. It looks like Vanellope is more comfortable in her surroundings as a princess in the new sneak peek than she has been in the past. In return, it looks like all of the Disney women have taken a liking to Vanellope as well. However, Ralph still seems a bit uneasy in his new surroundings. Wreck-It Ralph 2: Ralph Breaks the Internet leaves Litwak’s video arcade behind, venturing into the uncharted, expansive and thrilling world of the internet, which may or may not survive Ralph’s wrecking. Video game bad guy Ralph, who is voiced by John C. Reilly, and fellow misfit Vanellope von Schweetz (Sarah Silverman) must risk it all by traveling to the world wide web in search of a replacement part to save Vanellope’s video game, Sugar Rush. It’s evident right from the start that the duo is in way over their heads. In Wreck-It Ralph 2: Ralph Breaks the Internet, Ralph and Vanellope must rely on the citizens of the internet, aka the Netizens, to help navigate their way, including Yesss (Taraji P. Henson), who is the head algorithm and the heart and soul of the trend-making site “BuzzzTube,” and Shank (voice of Gal Gadot), a tough-as-nails driver from a gritty online auto-racing game called Slaughter Race. Directed by Rich Moore (Wreck-It Ralph) and Phil Johnston (co-writer Wreck-It Ralph, and produced by Clark Spencer (Wreck-It Ralph. Wreck-It Ralph 2: Ralph Breaks the Internet hits theaters on November 21st after years of anticipation. When the first installment opened in November of 2012, it turned in the highest opening weekend ever for a Walt Disney Animation Studios film at the time of release. Wreck-It Ralph even won the PGA Award for outstanding producer of an animated theatrical motion picture as well as five Annie Awards, including best animated feature, director, screenplay and actor. The film was named best animated feature by the Broadcast Film Critics Association, earned outstanding achievement in casting for an animated feature by the Casting Society of America, and won the Kids’ Choice Award for favorite animated movie. The film was also nominated for an Oscar and Golden Globe for best animated feature. While we wait for Wreck-It Ralph 2: Ralph Breaks the Internet to open in theaters, you can check out the new sneak peek below, thanks to the Walt Disney Animation Studios YouTube channel.